Over the New Year’s/festive period we had friends and family staying with us, not at the same time I might add. 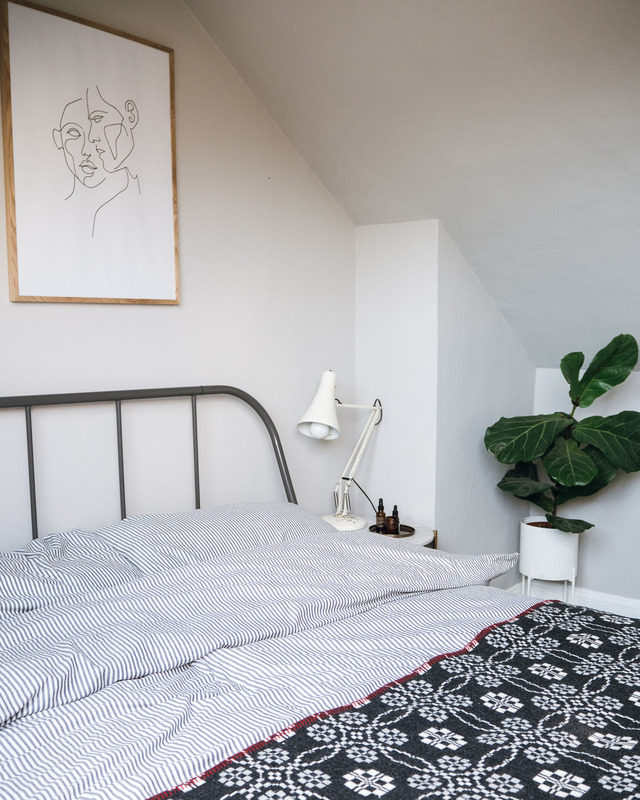 So to accommodate them, we decided to make over Charlie’s loft bedroom so it became a lovely place for guests to sleep whilst they were with us. Charlie didn’t mind sleeping on an airbed in Rufus’ room, as afterwards he would have a newly decorated bedroom and importantly a comfy new double mattress to go into the New Year with. 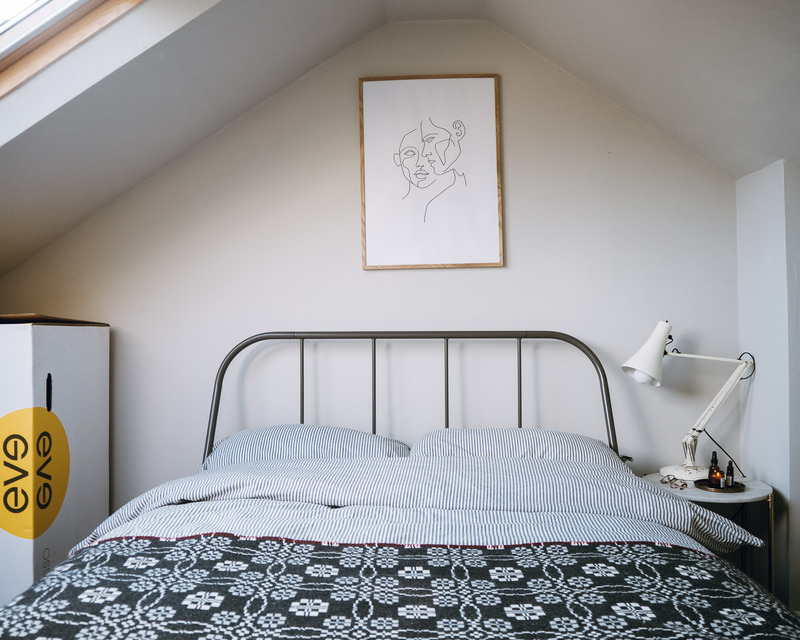 The space is a small loft conversion, with sloping ceiling and two large skylights. 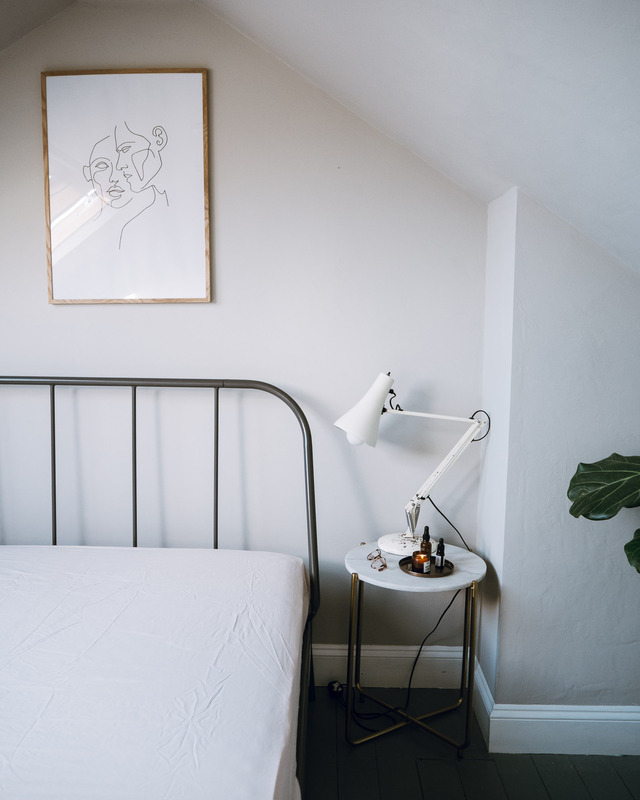 We wanted the space to feel calm and relaxing, with a scandi feel, so I chose a soft light grey for the walls and ceiling. Chambers Gate from Mylands – the same colour we had painted Rufus’ room. This grey is fast becoming my favourite colour, and I can see us painting it everywhere! It’s such a soft muted green/grey that suits all spaces. Perfect for a teen room / spare bedroom. Dan dismantled Charlie’s old single bed, and we took a trip up to Ikea to get a double bed for our guests. 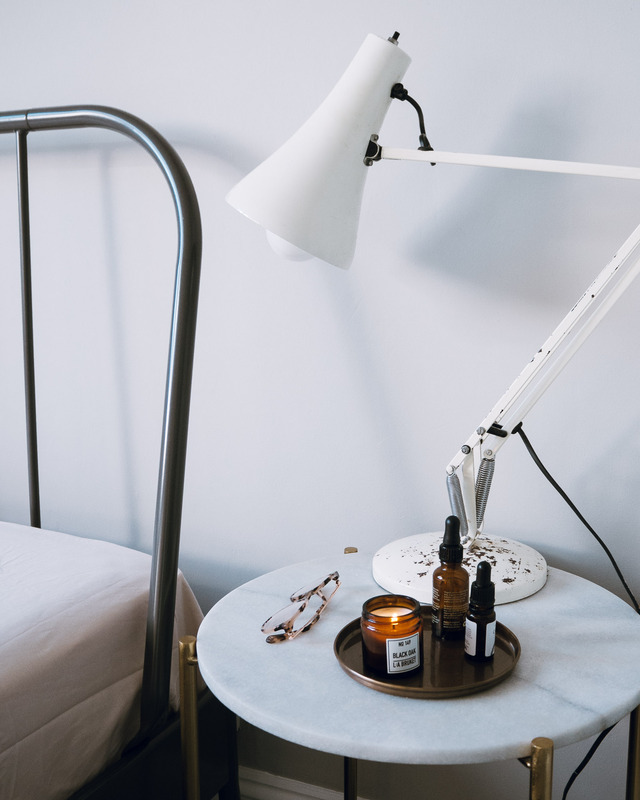 The Kopardal dark grey metal framed bed was perfect for all our needs. Plus the dark grey went really well with the wall colours. 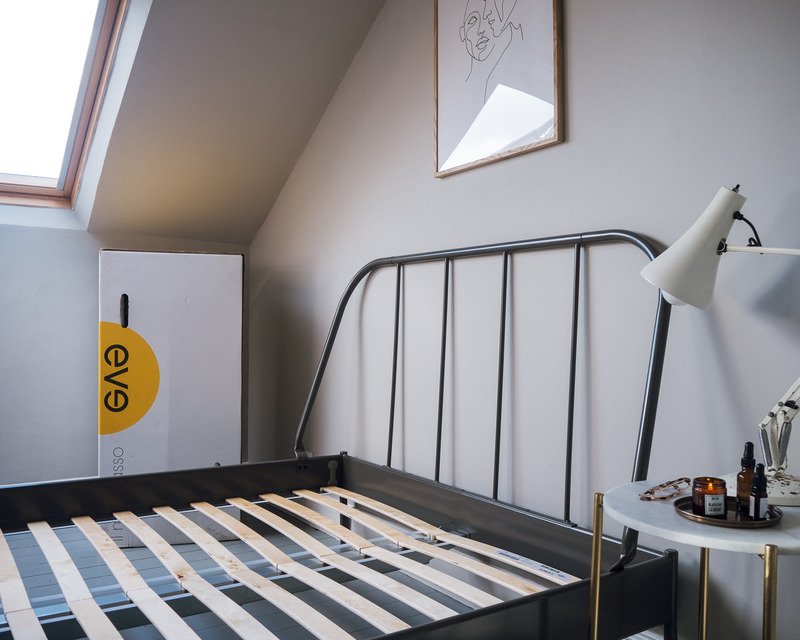 For the mattress we chose the Eve Sleep new premium double mattress, which came conveniently rolled up in a box. The delivery guys took the box straight up to the room, which was a godsend! 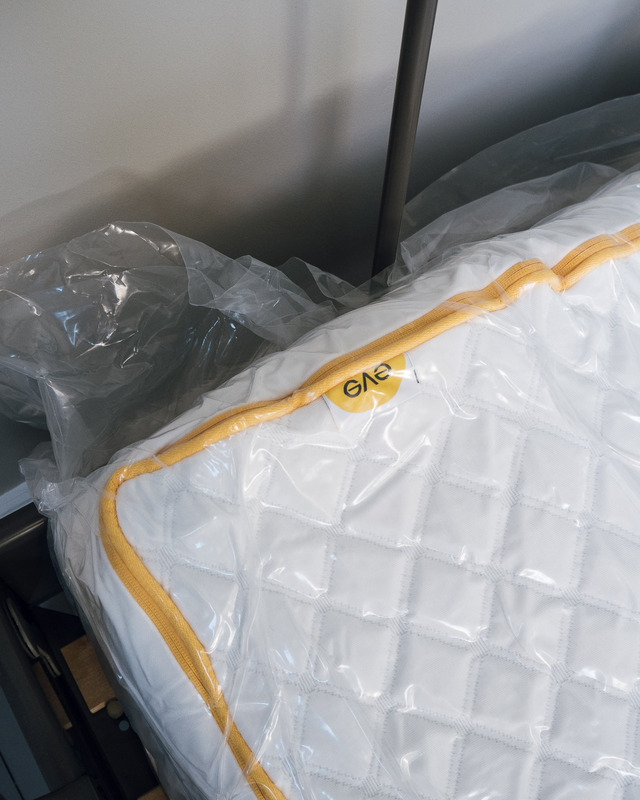 We chose the new premium memory foam mattress as it has four layers of foam to provide your body with spine alignment and added pressure relief. 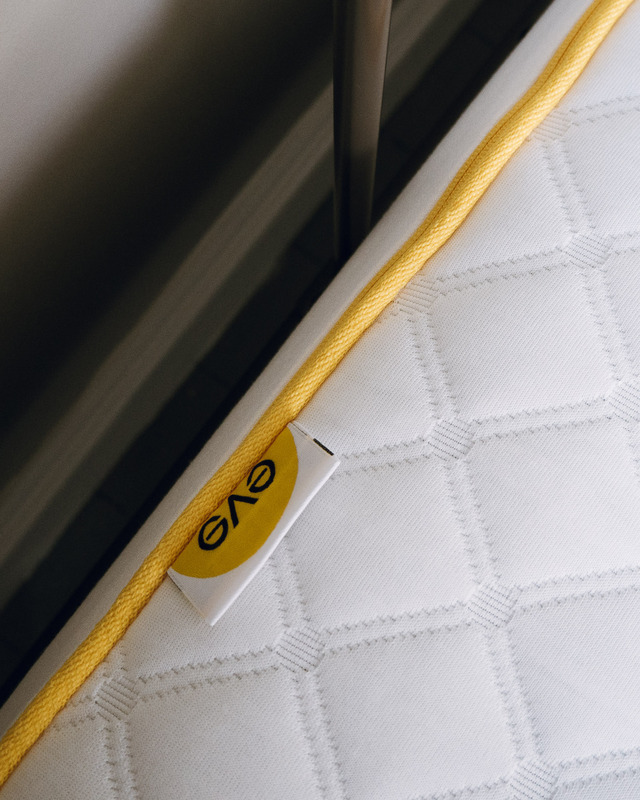 Plus it is perfect for all style of sleepers, as the mattress supports all positions. 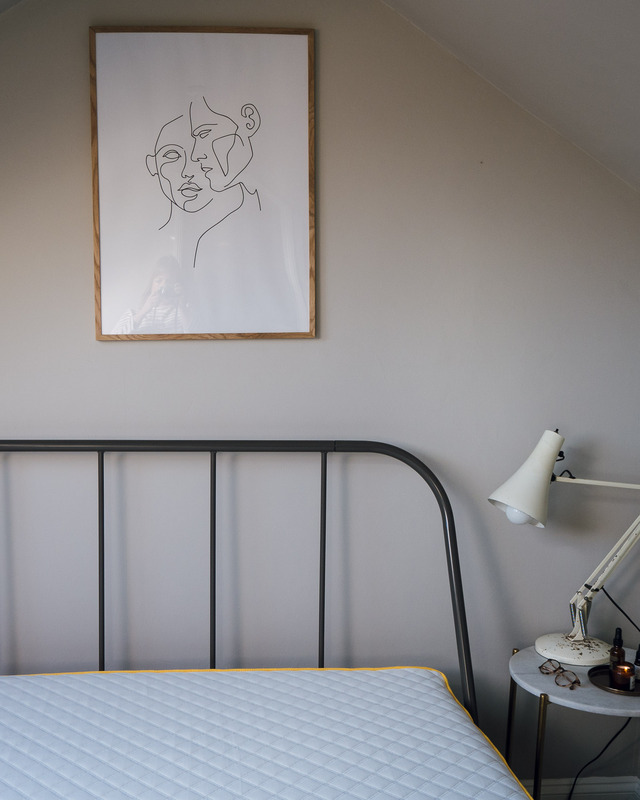 Once the plastic sheeting was removed, the memory foam mattress soon plumped up into shape and fitted the new bed frame perfectly. Dan couldn’t resist jumping on it to try it out, and found it comfortable with a medium-firm feel. We secretly wished it was our mattress! So how did we make sure that the loft room was more guest bedroom than teen room? Well, I removed most of Charlie’s things, putting his Lego and other kids items into decent storage. Bought a brand new chest of drawers to house not only his things but leaving a couple of drawers clear for guests. I bought up my bedside table and lamp for the room too, and put up a more grown up style of print above the bed. And added plant in the corner, and decent bedding to the mix. I added a few flourishes, like candles and hand cream and nice oils to the table, so that my guests felt at home. From Ikea I bought a simple grey and white ticking duvet cover and pillow set, and bought up the welsh blanket from the sofa to make the space cosy. I loved how the room turned out. Simple and relaxing. Our guests loved their bed, we had such positive comments on how comfortable the mattress is. Charlie is over the moon with his new bed… he loves to ‘star fish’ in there listening to the Arctic Monkeys. A room that can now accommodate guests as and when we need it, and a teenage boy full time. I shall share Charlie’s new room soon. Collaboration Note: This post was sponsored by Eve Sleep. The compensation received in exchange for placement on Littlegreenshed is used to purchase props, take and edit the images, write/edit the blog post and support Lou and her family.